thanksgiving gets a bit simpler every time we celebrate it, it seems. we decided years ago that we'd stay in town for the weekend from here on out, and we've settled into tasty vegetarian ways of observing a holiday which focuses in part on a big old dead bird. 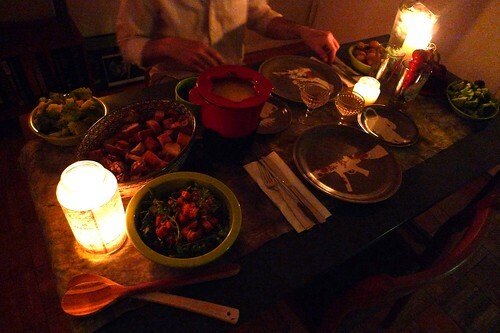 this year the meal was decidedly casual and local, the big pot of foreign cheese notwithstanding: we had fondue with fragrant baguettes from pain d'avignon at the essex street market (with absurd purple broccoli, math-glam romesco cauliflower, and brown cremini like fat little sparrows from union square), roasted butternut squash salad with warm cider vinaigrette (barefoot contessa, i salute you - i've already redeployed the recipe), and david lebovitz's butterscotch-pecan ice cream. a few of the veggies required a bit of prep, and i had to start the ice cream on wednesday night, but the heaviest lifting i did was at crate and barrel, for a proper pot (do not believe what snootier cookware-slingers will tell you about fondue vessels, internets; this cast-iron fellow got the job done for a quarter of what he would have cost elsewhere). joe conferred with our local wine shop for a few bottles of cava, i pulled our wedding dishes and a few vintage glasses down from our cabinet of favorites, and all was well on the lower east side.